The new 2015 Stokke Scoot V2 has been creating quite a buzz lately. It’s an updated version of the beloved Stokke Scoot which is a lightweight compact luxury stroller with a reversible seat. Unlike the old Scoot, the Scoot V2 has larger thicker wheels and better handle bar. I did like the old model a LOT, but the new V2 model is to die for! The larger thicker wheels really made a huge difference and put V2 above many others. Now, you can not only take it to the mall, or grocery shopping, but you can also go to the park for a long walk, or tackle uneven pavement of the city. Although it’s still not all-terrain stroller, it can handle a lot more of different terrains while providing your child with a smooth ride. I think this is a great choice for an urban lifestyle. I swear, sometimes the city streets are worse than forest trails. LOL. It’s also very stylish and modern stroller which is perfect for city moms who are always following the new trends. I also like the large canopy, adjustable foot rest, large easy to access basket and deep recline. Another great features of Scoot is the ONE-HAND fold that everybody wants to have. It does not have a bassinet option, but there is a Soft Bag (sold separately) for a newborn that you can insert right into the seat creating a bassinet like enclosed environment. You can also replace the seat with an infant car seat turning it into a travel system. The stroller weight limit is 45 lbs. While I gave the old Scoot only 4.5 out 5 stars, the new Scoot V2 gets 5 out of 5 stars from me because I absolutely love the new larger wheels. The weight went up 2 lbs to 25 lbs, but I think it’s justifiable now. To make this ride perfect, I would add a small zipper pocket in the back of the seat and make the recline one-hand lever recline. The price could also be a little lower. Other than that, it’s a great deal. You can get it right now for about $599 on Amazon (free shipping/free returns and no tax) in one of the seven beautiful colors. It comes with a rain cover and bug net. I put together a detailed comparison chart for you where I compare Nuna Mixx vs Stokke Scoot V2 vs UPPAbaby Cruz 2015. -Large canopy. The old model had a good canopy, but the new one is even better. Now, the pop-out sunvisor is even larger. The two panel canopy goes all the way to the bumper bar providing full sun protection. You can unzip it in the middle to expose a mesh window that provides better air circulation on a hot summer day and also serves as a peekaboo window since there is none of the canopy. Overall, very good canopy. -Adjustable handle bar. The handle bar has been updated. Now, it is a rotating handle bar instead of telescoping that goes from 36″ up to 42″ from the ground. It definitely provides more leg room for tall parents. -Reversible seat. The seat is pretty roomy with plenty of headroom for an older child. It is 14″ wide at the shoulder level and about 11″ wide at the bottom with 21″ seat back with a measurement of 24″ from the bottom of the seat to the top of the canopy. Doesn’t look like an egg? LOL. The coolest thing about this seat is that it positioned higher on the frame than an average stroller bringing your child closer to you. You can also use it instead of a high chair at the restaurant. The seat now has 3 recline positions instead of just two. The recline is operated by straps. To recline the seat you need to unlock both straps and bring the seat down. To bring the seat down you will need to reinsert the straps while lifting the seat up. This is not a very smooth operation especially if your child is falling asleep. I would like to see a lever recline instead. On the bright side, the recline is very deep so you can put your newborn in it. The seat limit is 45 lbs. This seat is reversible with the same recline positions in both modes. -Two mesh windows. Another new feature on V2 are two small mesh windows on the sides of the canopy which provide better air circulation when the seat is fully reclined. -5 point harness. It has a padded adjustable 5 point harness with a center release buckle that is hard to undo. Your 3-year old will not be able to escape. The harness has 3 positions and can be easily adjusted from the back of the seat. -Adjustable foot rest. There are two foot rests on the Scoot. One is part of the frame for an older child and another one is adjustable attached to the frame. You are probably used to seeing an adjustable leg rest that is part of the seat. Well, this one is a little different. It’s designed for a child to place his/her feet on it and does not provide any extra flat surface. You can slide it up and down the frame in both modes depending on you child’s height. While this design is very unique, I still do like leg rest better for a younger child. -Large basket. The basket is a great size. It will easily fit your large diaper bag. It is also very easy to access from the back of the sides. -Larger wheels. The wheels have been improved. These larger and thicker foam filled rubber tires will be able to handle much more terrain. You will never get a flat! The front wheels are 8″ while the rear wheels are 10″. Great for walks at the park, or busy city streets with uneven pavement. The front wheels are swivel, but can be locked straight. -All-wheel suspension. Makes the ride much smoother. -Parking brake. It has one-step parking brake located between the rear wheels. It’s NOT flip-flop friendly. -One-hand fold. One-hand fold is one of the most desirable features that parents want, but not many strollers have it. Well, Scoot V2 does! It’s a two step fold: First, bring the bottom of the seat up. Next, pull on the lever located underneath and the stroller will fold in half. You don’t even need to remove the seat. It’s a very compact package for a reversible seat model. To make it even more compact, you can remove the wheels. There is an automatic lock and a standing fold. -Soft Bag option. There is no bassinet available for this model, but there is a Soft Bag that you can purchase separately for a newborn. It inserts right into the seat creating a bed like environment. -Travel system option. You can turn Scoot V2 into a travel system by replacing the seat with an infant car seat. It works with Stokke iZi Go X1 by BeSafe without an adapter. You can plug the car seat right into the stroller. 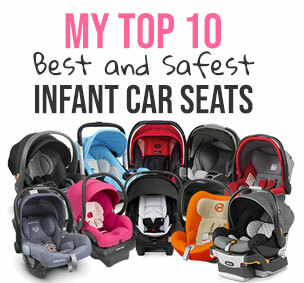 You can also use it with most popular car seat like Maxi-Cosi, Nuna, Cybex, Peg Perego with a purchase of an adapter. -Lack of storage. I almost have nothing bad to say which doesn’t happen too often. But since it’s a luxury expensive stroller, I would like to see a small zipper pocket in the back of the seat for some mommy essentials like keys, phone or wallet. -No bumper bar. I like to have a bumper bar as an extra safety feature. Also, my daughter Sophia likes to pull her self up by grabbing the bumper bar. I wish it was included. Unfortunately, it’s not even available for purchase. -Strap recline. I would like to see one-hand lever recline instead. Here is a video review from BabyGizmo for old model of Scoot. -Larger wheels. The new model has thicker foam filled tires with 10″ tires in the back and 8″ tires in the front. -Handle bar. It used to be a telescoping handle bar. Now, it is a rotating handle bar that goes up and down from 36″ up to 42 from the ground. -Pop-out sunvisor. It is a little larger now. -Three recline positions. They’ve added a new position to the recline. Now it has active, resting and napping positions in both forward and rear-facing modes. -Easier to remove canopy. The canopy is now much easier to remove for cleaning. -Two new mesh windows. Now, there are two mesh windows on the sides of the seat that you can see once you fully recline it. Stokke has 3-year warranty from the original date of purchase and you have to be the original owner. Here is more information on the warranty. For Stokke Scoot V2 is available in 7 colors: red, purple, slate blue, black, soft pink, aqua blue, and black melange. All of the strollers have a lightweight aluminum frame. I buy most of my strollers on Amazon because it usually has the lowest prices, free shipping, free returns and no tax. You can get Stokke Scoot V2 for at around $599 and it comes with rain cover and bug net. There is no bumper bar available as an accessory. I was not able to find a good sale on this luxury stroller. Just played around with this stroller in the store. I have to say that while beautifully made (the bigger wheels are great and the height of the seat is really nice), a few things didn’t work in my mind. The recline mechanism is more than a pain- particularly if you want an intermediate reclining position. The clips would not be easy to fiddle with if you had any distractions. Also, the lowest recline did not seems anywhere near flat. I didn’t get a chance to use the soft bag with it but it wouldn’t seem to a reasonable substitute for a bassinet. Also, the basket, while roomy, has low sides- why did they do this? It would be more useful if it was deeper. And it seems a little fragile to me. Just my impressions. I just ordered a Scoot, based off your review and my cousin uses hers all the time. I can’t wait till it comes. I went for the purple one as I also have a MyCarrier in Purple. I hope that my idea of carrying the stroller on the bus with the baby in the MyCarrier will be great for long outings on hot summer days. Plus, it’s getting nearly if not impossible to have a stroller on the buses in my city. Too many parents and some can get rude about the space you take up. I think I’ll love the Scoot once it gets here. I also like that you can “dress it up”. I did at first order V1 as it was $459 but the store called me when they could to tell me that they no longer had the V1 in purple, damaged while on pallet. So, wonderful customer service from “Stroller Depot” they offered me the V2 at cost. SO, I got it for $485ish! It’s also was nice when you get a store willing to go the extra mile. Next time I order online baby stuff I might stick with them, even if I don’t get an awesome deal. I’m replying to give you a follow-up! First thing you might want to let people know not all stores will give you the cup holder with the V2 Scoot. Yet, Stroller Depot out of CO is a great place to get awesome customer service. I got my scoot from them and then ordered the footmuffs and they gave me a 15% discount on them. I live in OH but called SD and if you look them up on Yelp! It looks like they treat all their customers the way they have me, I’m going to buy all my accessories from them! Plus, they use FedEx or UPS and it got to me within 3-4 days. Now, I have only had the stroller a few days now. I totally love it! I love the fact she can face me, the stroller can be a sub for a Highchair, it is neat that you can remove the seat and throw it in the wash, that you get the bug net & rain cover with it and just the size of it. It is too heavy to do what I was planning but I might be able to make it work. Can you get a bumper bar? Plus, the fact you can lay it down enough your baby can take a nap is awesome! I think it is much better made than the totally lightweight stroller I see for older kids, I think I’ll get my use out of it. The little one likes it too! She likes that she can be with mommy and apart of what is going on. I also like the Stokke brand. I wish I could afford more from them. Plus, it seems that over the last few months that I’ve been looking at the strollers from then their prices have been coming down by a few hundred even. Maybe they are trying to have a us base to help with prices. Just a heads up for others. Sorry, I know it’s long but it’s how I feel. I love the Stokke Scoot and I think other who can justify the price would feel the same. P.S. Forgot to mention that there are two rings that you can clip a diaper bag onto behind the seat. It’s for their bag but I got mine to work with them. Hi! Am seriously considering the Scoot but am also inclined to get the Crusi instead because it seems as though there are more accessories available for that model. You had mentioned a bumper bar that can be bought separately. Where can I find that? OK thanks Susan – in the ‘Where to Buy’ section, you had stated that the bumper bar needs to be purchased separately. So I wasn’t sure if there was a generic bar I could buy to attach on. Mary I just wanted to let you know that I got the footmuffs for the Scoot and they work just fine. If you don’t care about switching the textiles out or having the carry cot, which I thought I read somewhere on the V2 you can use a carry cot. Still if you can I would have gone with a Crusi if it wasn’t so far out of our budget. Thanks Katy and Susan for all your help. I decided on the Scoot for the one-hand fold. And I’m loving the size. I was able to find stroller accessories – almost everything except the bumper bar and snack tray. Thanks again! That’s what I loved about the Scoot too! It’s been perfect for bus travel here. Plus, paired with the footmuffs when it was 20 degrees here she fell asleep when it was her nap time while we were waiting on a bus. Then slept through me getting on and off the bus. Just thought I would share this with you for your readers. I don’t like Stokke’s cup holder but you can get a Skip Hop Stroller Organizer that works a lot better. Plus, if they live anywhere that is cold in the winter getting the footmuffs is almost a must. Last weekend Friday here was 20ish but I had to be out shopping. I had my LO with her blanket and the footmuffs around her, she looked like she was all sunggled up like a bug in a rug. She slept for about and hour of me getting on and off a bus. Then on Saturday we had to walk a block away. I put the rain cover over her in the footmuffs and the snowy weather didn’t brother her. I love the Scoot and I love Stokke’s MyCarrier as a team! Pls help me….I need to decide if buy a stokke scoot or a stokke trailz. I live in Prague, have an 17 months girl. And next year starts thinking on another baby. So i prefer the trailz due the bassinet. Can you give your opinion about trailz pls. HI, Thank you for your amazing reviews! I am a soon-to-be FTM. I purchased the Vista but am not second-guessing and wondering if a slightly more compact stroller like this one would be better. I love the bassinet with teh Vista and the ability to convert to a double later. (And I got it in Wheat/Lindsay..which I think is so beautiful for a little girl :)) BUT…We live in Houston, so there’s not the everyday city strolling like in SF, NY or Chicago. I will be using it for grocery shopping, sidewalks, etc. and want easy fold-up to put in the trunk. We also got a City Mini for travel. AND I would like to get a jogging stroller (to actually jog with). Also, the Mesa infant seat doesn’t fit in my car, so that’s not a consideration. I’m a hestant and a little overwhelmed that we’ll end up with three strollers and it’ll be overkill! Would LOVE your advice. Hi- I was wondering what is the difference between the Scoot V2 and the Crusi? I know the Crusi you can always add a seat at the bottom but wondering why one would buy one stroller over the other? Also within the Scoot is there a place where little guys can rest their legs when sleeping? I know for the original scoot I’ve heard people complain about this especially with newborns. Thanks so much! I’m just so confused. Im stuck between the Skoot V2 and the Crusi as well, did you decide on which one to get? If so which did you choose and why? I am not very strong and am concerned about the weight of some of the strollers. I live in the inner city and use public transport. For that reason I am leaning towards the Bugaboo Bee rather than the Stokke Scoot. What do you think? What do you think about Stokke Scoot for a newborn? And how important is the bumper bar? We are choosing between Scoot and Urbo 2 to be only one stroller for our newborn. Which one do you recommend for us? I’ve a smaller hatch back car and wanted to have lots of space in the boot after the pushchair has been placed. i guess, hand bumper bar will be very important for naughty kids, like if they try to stand with in the stroller Lolz…, but no idea how my kid will be, what are your thoughts. I’m looking to buy only one pushchair which last ages…. FTM to be in July here. Just saw this review and now I’m leaning towards the Stokke Scoot V2 for my child. I would prefer to buy one stroller instead of multiples, and I like the look of this one. I was originally torn between the Stokke Xplory and the Bugaboo Chameleon3. One of my stroller criteria is that I want it to look stylish, as well as practical. I live in Dubai, so it’s super hot most of the year. This means we’re mostly indoors, in the malls and such, and only really go outside for about 4 months of the year, 5 if we’re lucky with the weather. I do drive an SUV with ample trunk room, but I would prefer that my stroller not be too bulky and heavy, and that is easy to open and close for when I’m out with the baby alone without the husband, or anyone else for that matter. I would love your opinion! Thanks! Hi, I just sold my stokke crusi which i had for a year. My little is one year and im really looking for a stroller that takes less space in the car and is lightweight. Should i consider Scoot or go for something different? stoke scoot v2 vs armadillo flip xt?????? I’m living in Russia and as you can imagine it gets pretty cold here for at least 5 months. I need a stroller for my newborn baby yet I have a few criterias. I have spinal hernia, so I need something light and compact due to stairs at the entrace of our apartment. I was advised the Inglesina Trilogy but the wheels seem to a little small for snow. I love the Scoot V2 since it has one hand fold and not sooo heavy. But not having bumper bar is a question mark. Do you think it’s a must? Or can you advise another for cold weather? I am still deciding between scoot v2 and nuna mixx. My daughter is 3 months old now. Which one is more comfortable for her? And which is nice and easy to push, and good for travel (plane, car)? Hi Susan. I read your reviews on the Stokke V2 and the Mixx. It seems that the only thing “wrong” with the mixx is a very slightly less convenient fold- but its much better for recline, basket and has a belly bar. I def will be going on a subway- but is the fold THAT much less convenient on a seemingly better stroller- the Mixx that you would choose the Stokke over it? Or is the seat recline much less convenient and stick with the (still seemingly ok) fold on the Mixx? Sorry im a first time mom and cant decide! I am gettkng the Nuna Pipa carseat either way. Thanks. Will you weigh in your opinion, please? FTM here with my baby boy due in March 2016. I’ve been looking at strollers and love the luxury look of the Stokke Scoot in Black Melange. This stroller looks timeless and classy! Would you recommend getting the Stokke PIPA™ by Nuna® Car Seat & Base (Infant Car Seat) to go with this stroller? They sell it at Nordstrom’s. Do you know if this particular car seat is safe or happen to know the safety rating? Up to what age on average can a child use this Stokke Scoot Stroller? Loved your review! Thanks in advance for your time. Look forward to your reply. My sister is having her third child, and i had my fourth, he is about to outgrow his infant car seat and was thinking of giving her it. She wants the stokke scoot stroller but we are having trouble in finding an adapter for the BOB (Britax) infant car seat. Is there other adapters that are compatible with the carseat for the stroller? purchase the Scoot about 3 moth ago and it broke. I used it only 3x the from wheel come of. Could you tell me please if I would be able to take the stroller inside the aircraft? When can I start using the recline positions from Stokke Scoot V2? I’m in between the stokke xplore black true timeless but not liking the bag at the bottom very much. Therefore I was looking at the scoot, but considering to have a second kid a year after the first. so I’ll need a stroller that holds two in the future. I’m also a big traveler road trips and planes. Also is the stokke carseat infant to toddler? I was considering the Stokke options, orbit g3, or bugaboo. Help! I have just purchased a used one. Help, I’m trying to remove the seat textiles to wash but can’t find any info on line. I’m not sure how to remove the arms that the canopy attaches too. I don’t want to force anything.